Vacation rental cabin / bungalow. Sleeps 6, 2 bedrooms, 0.75 bathroom. No pets allowed. Smart TV has a Netflix account free for guests to use. Guests are welcome to use their own Hulu or Amazon accounts. Out of view in this bathroom is the Stand-up Shower and the washer and dryer. View from the shoreline of the property. WATERFRONT! 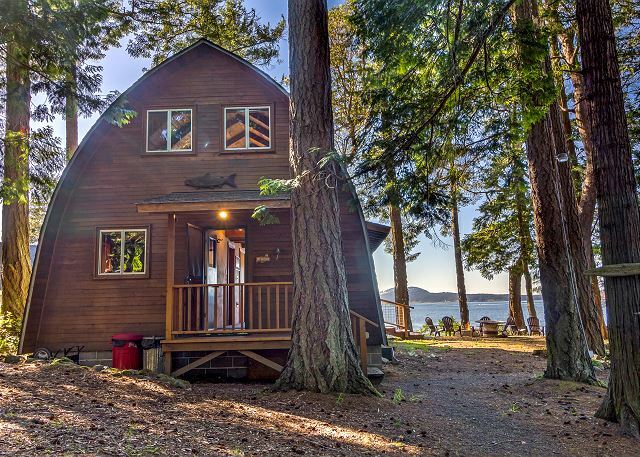 The Elephant house is a unique and cozy waterfront island retreat! Decorated with elephants throughout and offering wonderful Spieden Channel views it's no doubt a place for enjoyment and relaxation. 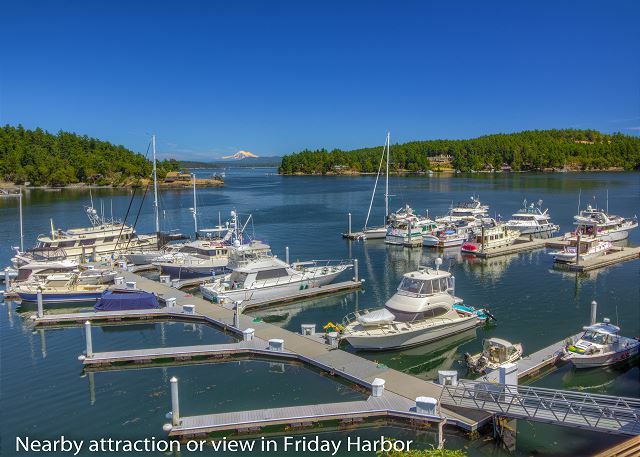 Located about a mile from Roche Harbor, this retreat is convenient to many amenities including shopping, dining, and nightlife activities, if you desire. 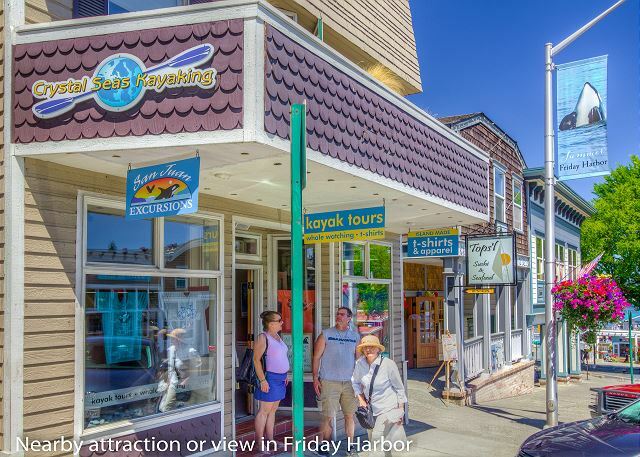 Enjoy walks, bike rides or launch small boats or kayaks from the community beach at the isthmus. 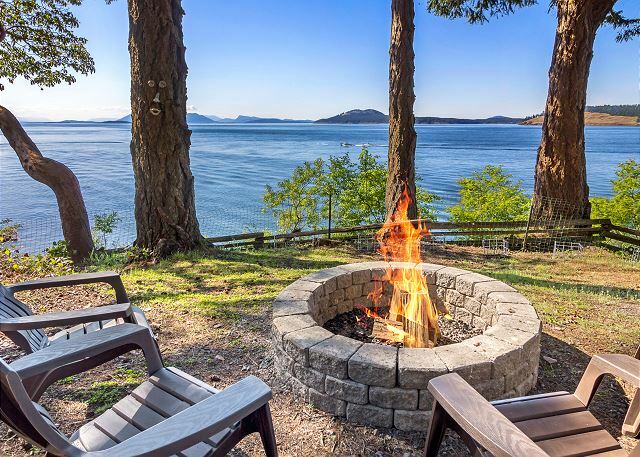 Indulge in the different varieties of wildlife such as birds, eagles, seals, whales, deer, and fox that inhabit the areas around this home. Accommodations include a master loft furnished with a king sized bed, and a sitting area that looks out a picture window to the water. 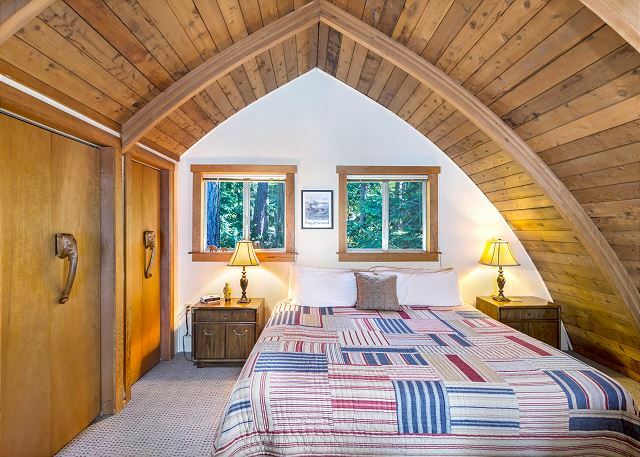 The second room is located on the main level and is furnished with a queen sized bed. Enjoy relaxing evenings around the stove in the living room or out enjoying the sunset barbecuing on the deck. A true island cabin! ** Parents please be aware that this home has high-bank waterfront exposure and although the owners welcome families, the home may not be suitable for all children. This house has good cell phone reception. This house does have Internet access. We had a wonderful stay! The location is beautiful, and we saw orcas swimming by at least three times. The fire pit outside really is fantastic, with plenty of firewood. 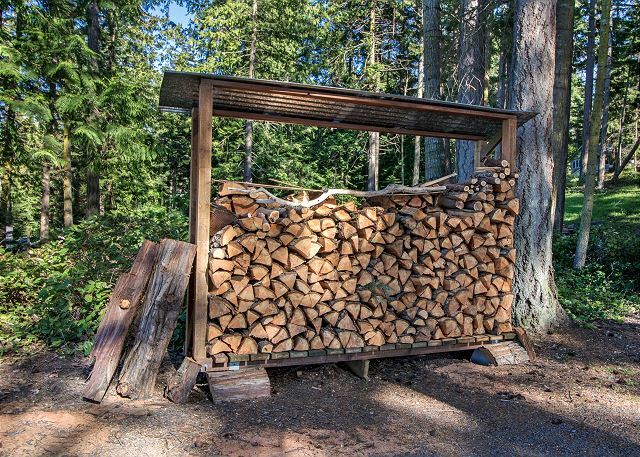 It's an unfussy, cozy cabin that was perfect for two couples and a baby. Our family rented the Elephant house through San Juan property Management two years in a row. The home is clean, comfortable and thoroughly charming. Sitting on the deck with the full view of the sea and its wild life is hard to beat. We even saw a pod of whales while relaxing on the lawn chairs! The management company is super easy to work with and you can book other activities through them as well. We highly recommend taking a whale watching tour on the Odessy. 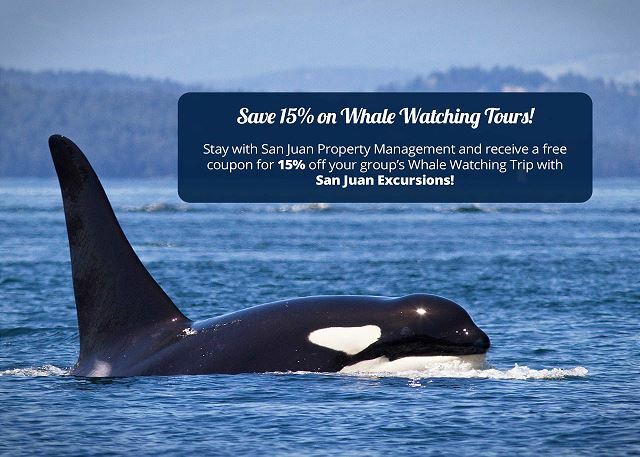 It's a great way to see the surrounding islands and learn the history of the area as well as viewing several species of whales. The Elephant house and the islands will always hold a special place in our families hearts! We look forward to our next stay! 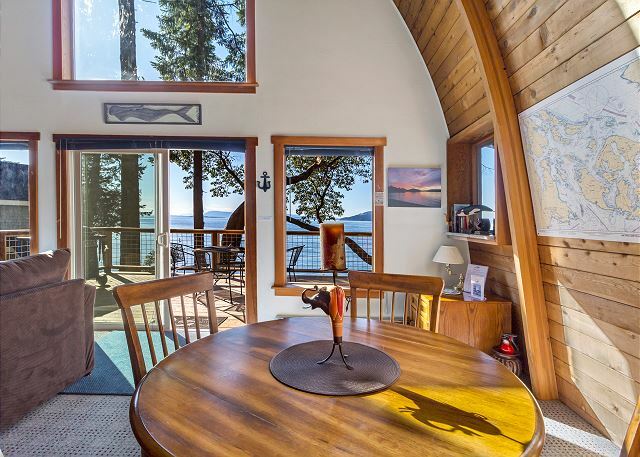 Great home on the water - everything was very clean and comfortable - super quiet yet within 20mn to Friday Harbor and 10mn to Roche Harbor. Everything you need is there. 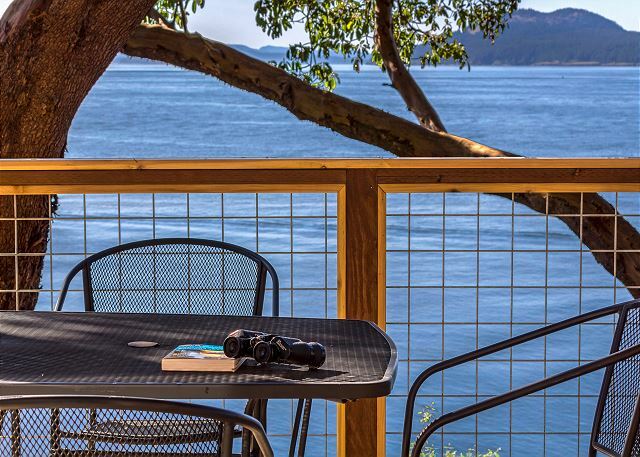 Beautiful views of the bay every day, with gorgeous sunsets and views of porpoises every day. We used the BBQ and the firepit for a fun evening out. Perfect for 2 couples or 1 couple and 2 kids. Highly recommended! We loved Elephant House - the location is wonderful, the home is clean and had everything we needed. The sunsets from the deck were spectacular! Wonderful waterfront cabin for family vacation. The Elephant house provided a very comfortable home base for some wonderful cycling, hiking, and whale watching. The view from the house is fantastic with plenty of wildlife in the proximity. on side, although it did not distract from our enjoyment. We had a FANTASTIC time at this rental! Seriously, for the price, it is a steal. Every year my husband, myself, and two other married couples do a weekend getaway so we split the cost three ways and it was an amazing deal. The view is BREATH TAKING. We so 7 sealions at one time and the house is super cool too! The only bummer is having to check out so early in the monring. Aside from that, we'd do it again in a heart beat! We enjoyed a Thanksgiving getaway at the Elephant House and it didn't disappoint. 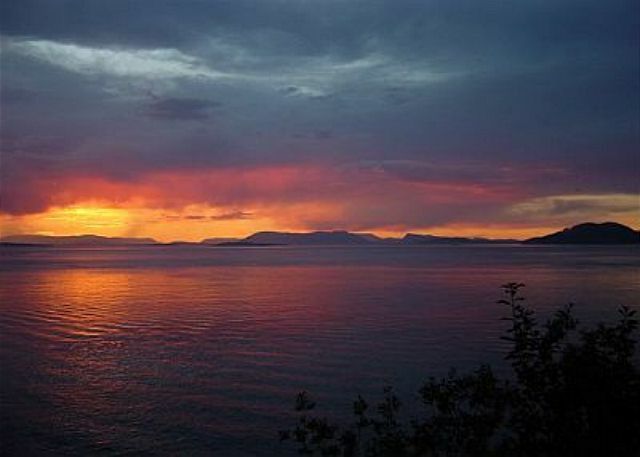 In was in a great location and had magnificent views of the water and surrounding islands. The house was the perfect size for our family and we very much enjoyed our stay. Absolutely perfect stay. We started a fire before we even unloaded our bags -the view from the fire put was stunning. Ships, boats and ferries going by and Saw a humpback whale on the fist night! Property was beautiful and kitchen was adequate for cooking. We wished there had been more nights available and we hope to return if our schedule allows! Thank you! Our family had the best vacation we've had in years! Working with San Juan Property Management was a breeze. Elephant House was clean, very comfortable and beautifully charming! The views from the house and large deck are unbeatable. We are already planning another trip for next year! The house was well stock with everything you would need. Very clean and cozy The views were amazing. Enjoyed the fire pit every night. I would highly recommend staying here. The cabin was fabulous; the stocking of the kitchen was excellent; we have seen seals and porpoises from the Patio, a racoon and of Course some deer. We have taken annual vacations for years. But this vacation to San Juan topped any previous vacation experience! The natural beauty; the peace and solitude. I can only say STUPENDOUS! We loved our stay. The views, wild life and quiet were the highlights of our stay at Elephant house. 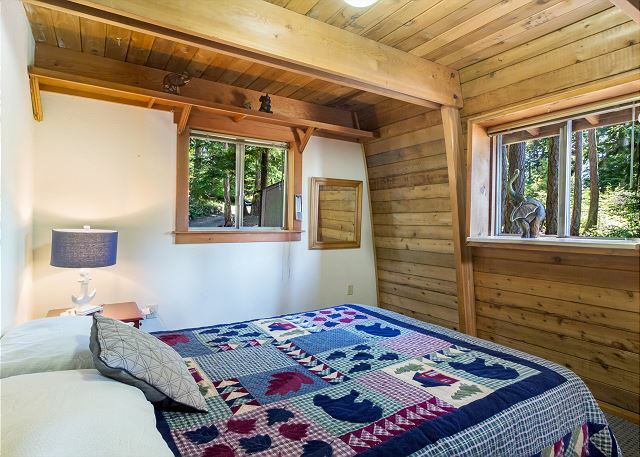 The cozy, yet modest feel met all of our needs and the location and views exceed our expectations. We'll definitely return. We had a great time at the Elephant House. Everything we needed and nothing we did not. Highly recommended for an unplugged vacation with perfect views. We had a great time. Beautiful location and view of the water. The cabin was comfy, clean and inviting. 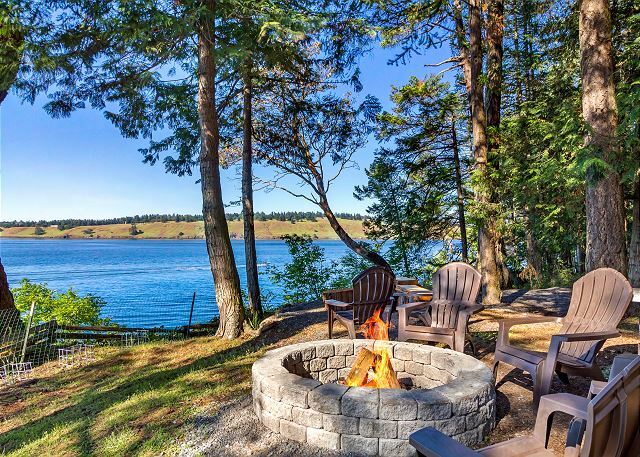 We cooked meals, watched movies and played games at the cabin and had a great time exploring the Roach Harbor Resort, Friday Harbor and the wonderful state and regional parks on the island. 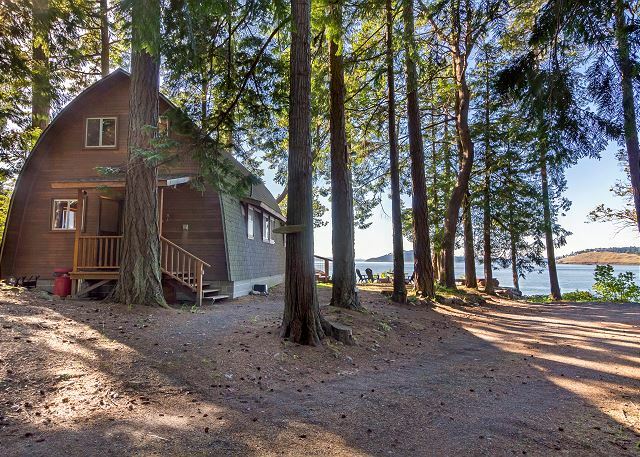 this cabin tucked behind the trees, right on the water. Everything we needed and nothing we didn't! We really enjoyed our stay at the Elephant House. Awesome sunsets every night. Enjoyed the seals splashing around. Also saw deer and porpoise. The cabin had everything we needed and it was a great location. We will definitely be back. Great views, very quit and great memories! The elephant house was perfect for our families stay on Friday Habor. This propert was very comfortable and fully equipped. Around in the evening. Mile and a quarter walk to Roche Harbor. Nice deck with a new BBQ. 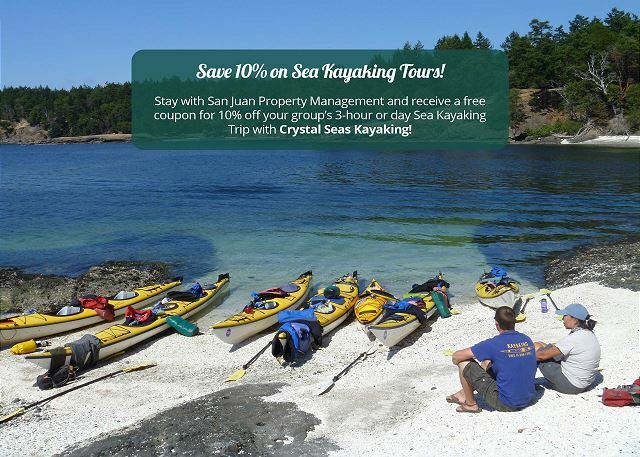 This was my first trip to the San Juan Islands and I loved the Elephant House!! It had everything we needed and I was sad to leave. I plan on staying there again next year...which can't come soon enough!! Elephant house has real soul and is in such a breathtakingly beautiful location I'm so happy to have rented it. I was a little concerned about the 70's look of it on line and carpeting in the bathroom, but the property is so well managed and everything was so clean that my funkiness concerns evaporated the minute we walked in. The view from the upstairs bed is pretty magical, and with the sunset lasting so long (dark at 10:00) it was fun to watch the light still changing from up there and to wake up and look out. 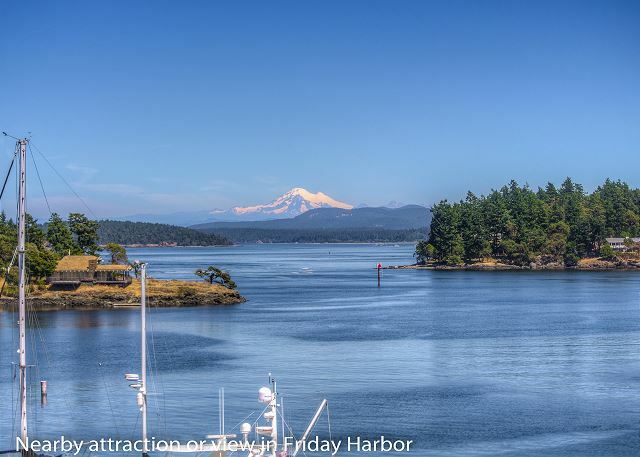 We were surprised to have such terrific weather for our mid-October visit to San Juan Island. Each morning and each night the sun reflected fall pastel colors through the large water-view windows. 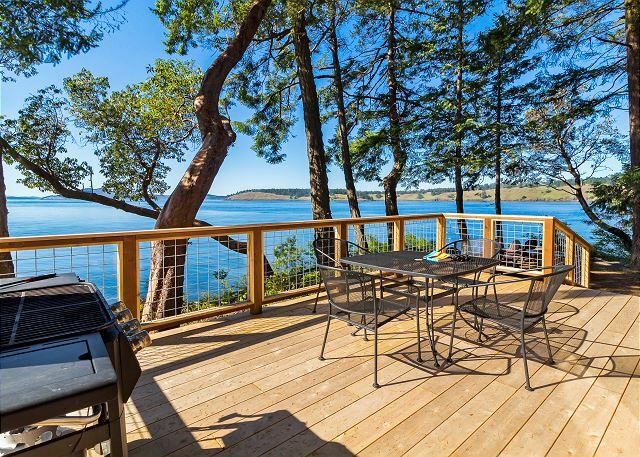 We saw sea otters and porpoises from the living room, grilled each night on the comfortable deck, appreciating the built in bench, and put the kitchen to full use. We ran a 3 mile loop each morning through Roche Harbor, and enjoyed hiking both British and American Camps. 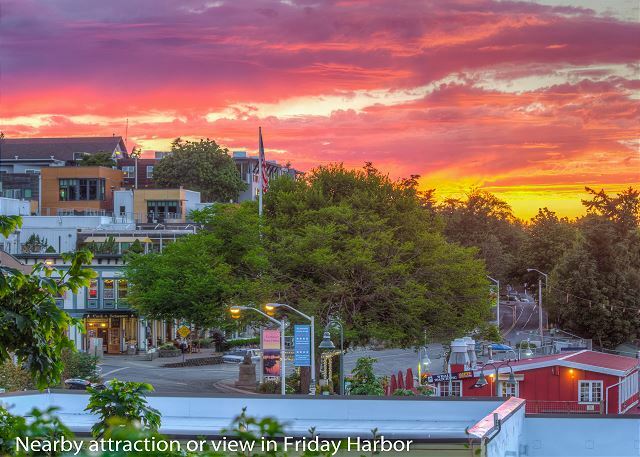 We explored and picnicked at the lighthouse, bought gorgeous items at the Alpaca Farm, and even went to Friday Harbor for the film fest (but got distracted by the football game showing in family-friendly restaurant comfort). EH isn't a fancy place, but simple and clean, and well-lived in. The kitchen faucet is mentioned elsewhere, and seemed so trite until each of us took turns cursing it, and the unneeded showers we kept taking from it's erupting spray! That's my only complaint. My 85 yo uncle, 9 yo daughter, husband and I enjoyed our stay at Elephant House. Excellent place near Roche Harbor. Everything was great, except we couldn't get the washing machine started -- maybe we just couldn't figure out how. a guest from Whittier, CA does not recommend this vacation rental. The location was amazing. The cabin was great but does need furniture and bedding upgrading. The sofa bed was not useable, so that made it difficult for us. But the overall experience was wonderful. Thank you. WE absolutely loved the location of this property. We could not have asked for a more beautiful view! We enjoyed the houses lay-out but it was a little dated. The deck was fabulous but also needed some repair as the railing was broken. But all in all we loved it and it was the most relaxing vacation I have had in years! 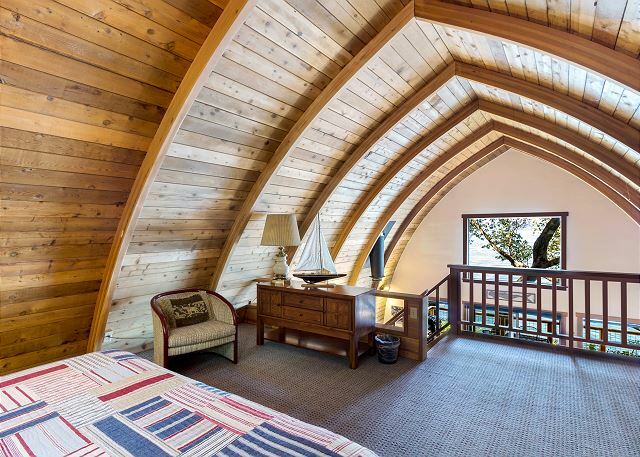 We needed a place for our family of six to stay while attending a wedding at Roche Harbor. Although cozy, this cottage was the perfect place for us. The views are unparalleled and the daily gymnastics of the seals right off the deck were always entertaining. 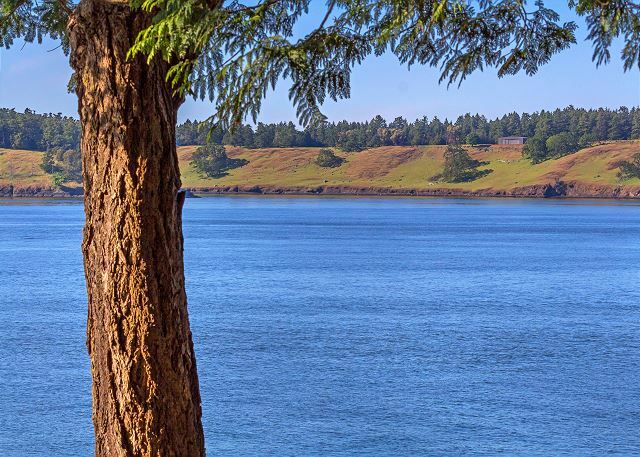 From this spot, we were able to go for a day sail (highly recommend Captain Howard, see his website), explore Lime Kiln State Park (no whales), visit the Mausaleaum, hike, and explore Friday Harbor. The loft and 1 BR were perfect for us; the kitchen/bath/laundry were appropriately stocked. The kids say it was the best vacation we've ever had. We want a little cottage of our own now on the same island. Thank you so much for sharing a piece of heaven with us. Beautiful sunsets from deck (June). Whales, Bald eagles around. Great private scenic location, SJ Property Mgt. was fast and professional, we thoroughly enjoyed our visit to the island and staying at the Elephant House. 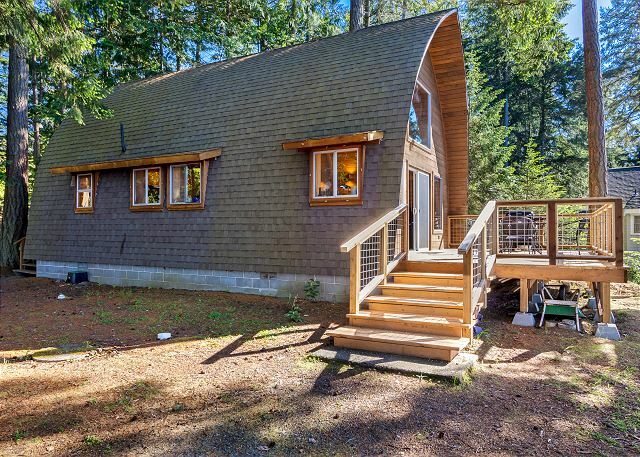 We had a wonderful three night stay in this funky two bedroom cabin. Even though it was quite cold outside (we stayed through New Years)it was warm and cozy inside. The cabin had everything we needed and then some! The view was amazing! We plan on going back during the summer when it is warmer and we can sit out on the deck and have a BBQ! Thank you for sharing this relaxing get away with us. San Juan Property Mgmt was an extremely easy company to work with. The property was exactly as described, their booking was easy and when we called with a question it was answered promptly. I highly recommend them as a company. The property itself is wonderful. The location is perfect. We loved not having a TV or internet. The view was entertainment enough. The house is delightful, clean, cute, quiet and well-stocked. You really dont need to bring anything. About the only thing that is a problem with the house is that the upstairs floor squeaks quite loudly. Not a big deal. This is not a luxury property, but it is very clean, well-stocked, and most importantly super well located! The home has the most important attributes: a great location RIGHT on the water, a wonderful deck and big windows from which to enjoy it. We spent most of our time outside cooking on the gas grill, sitting around talking and enjoying the view (including using the 3 pairs of binoculars provided). We had fabulous weather in early September which helped a lot too. Nice 1.6 mile walk to Roche Harbor and really nowhere on the island is too far a drive. The Elephant House was a great, cozy, beautiful setting and home base for our vacation. 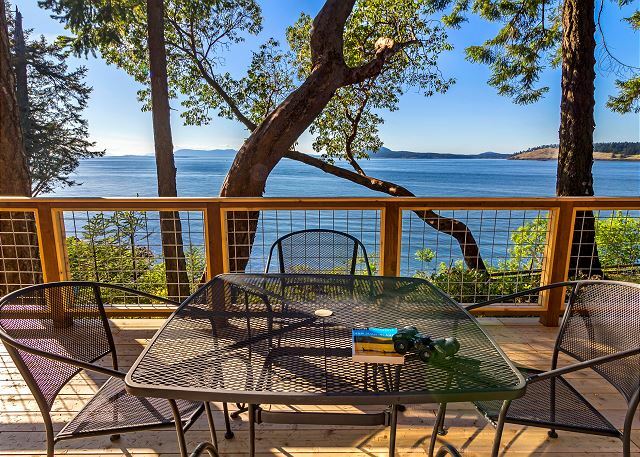 Perfectly located on a quiet waterfront stretch about a 20 minute drive from Friday Harbor. Could stand to have a little more light (up in the loft, particularly), and the sound on the television/DVD player didn't work when we tried it. That said, it was a wonderful place to get away from it all and the shortcomings only encourage greater peacefulness. Very quiet and relaxing time at the Elephant House. Great spot if you don't require beach access, you can find that down the street. Didn't use the TV for movies, couldn't get any sound to work, 29 year old TV. We spent a couple hours watching the Orca Whales from our boat, always fun to see. Sunny weather and beautiful sunsets. Spectacular views and sunsets. The location is perfect, calm and serene. Very professional staff, that made this a seamless vacation. Thank You. Great stay at the Elephant House. It was a last minute booking but well worth it. Very quiet and beautiful location. You can view the ocean an inhabitants form the deck. Small problems- no dishwasher although rental company wants it loaded before you leave, inadequate light in loft bedroom and many of the electrical outlets don't work.